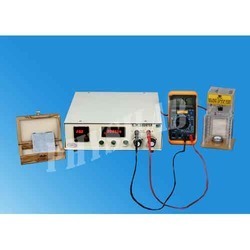 Instrument consists of power supply for G. M. Tube with digital readout meter. 6 digit counting system with its power supply. Controls for reset, start & stop through in panel. One presentable timer with 3 digit display & thumb wheel switch. Complete with G. M. Tube stand & one radio active source beta. We are fruitfully catering to the assorted demands of the customers by manufacturing Digital G M Counter. We are involved in manufacturing and exporting G.M. Counter Digital instruments, which consist of power supply for G.M. tubes with digital read out meter. These are 6 digit counting systems with its power supply and the control for reset, start and stop is operated through panel. Our customers can buy these digital counters at industry leading prices from us. We are offering good quality product like Geiger Muller Counting System. G.M. digital counters offered by us are used in G.M. tubes and come with digital read out meter facility. These digit counting systems are also provided with control for reset, start stop through panel.